In what likely is the first visible peek into the behavior of consumers using so-called “dark social”media, some first-of-its-kind data suggests that strikingly different patterns are emerging in terms of the way people consume -- and share -- media in “peer-to-peer” vs. public social media outlets. The data, which comes from 33Across’ Tynt platform, is the first to track the content that consumers copy, paste and share across all digital media -- both public social media networks like Facebook, Twitter and blogs, as well as interpersonal dark social media like email, SMS text, etc. What the data suggests is that while consumers typically share content from major publishers like entertainment and general news sites publicly, they gravitate far more toward the long-tail of published content when they share things interpersonally. The finding is significant for several reasons, but especially for smaller and longer-tail publishers that are usually overlooked by mainstream agencies and brands that tend to focus on the biggest publishers -- a trend that has become exacerbated as they focus more of their energy analyzing the value and impact of consumer behavior on big social media networks, which in reality represent only a fraction of the way consumers share media content with each other. According to Tynt's data, that could be contributing to a massive distortion of actual consumer behavior. Based on its most recent findings, Dark Social currently represents about 71% of all social-sharing, while Light Social represents only 29%. The skews become even more exaggerated when 33Across began to dig into specific forms of content sharing, especially types of information consumers are prone to keep to themselves or a handful of close friends. Take a category like financial news and information, for example. According to the Tynt data, 90% of social traffic coming to business and financial publishers of all kinds -- both big and small -- is generated from Dark Social vs. only 10% from Light Social. By contrast,Tynt's data shows that media and entertainment news and information publishers -- sites that cover high profile content like TV, movies, etc. 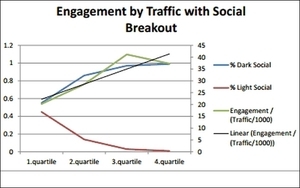 -- currently generate about two-thirds (67%) of their social traffic from Light Social networks. Haskins says 33Across hopes to develop a standard index for tracking and analyzing these relationships, but in the near term he says the data indicates how important it is for advertisers to begin looking beneath the surface of the most visible social media trends and behaviors to understand how consumers are actually interacting with content. “From a business perspective it's important for advertisers to not only understand this dynamic when they are creating their advertising, but also to develop approaches for messaging to consumers at these key moments of sharing,” he says. 3 comments about "Data Puts New Tynt On 'Dark' Social, Sheds Light On Unseen Power Of The Long Tail". Diana D'Itri from IDR Broadcasting, May 17, 2014 at 5:07 p.m. Dark is an interesting choice for the word describing a more 'private, restricted or controlled' form of social sharing. Thank you for enlightening me to the obvious 'dark vs. light' social, makes sense but I still think labeling private sharing 'dark' isn't a true description for this behavior. Joe Mandese from MediaPost, May 17, 2014 at 6:36 p.m.
Diana - The word dark has many connotations, but in this case it is used to refer to something that is not a visible part of the social universe - kind of like the term "dark matter" in the physical universe. It is not meant to imply something nefarious. Pete Austin from Fresh Relevance, May 19, 2014 at 4:23 a.m. Totally agree that the word "dark" is unfortunate in this case. Here's a related example: "darknets are often associated with dissident political communications and illegal activities": http://en.wikipedia.org/wiki/Darknet_%28file_sharing%29. Nevertheless, Dark Social is such a useful descriptor that I'm going to start using it immediately.